Oh yes, it’s giveaway time again, and what a treat we have for you this month. Would you like to win this delicious gingerbread cake? Yes? Then read on! 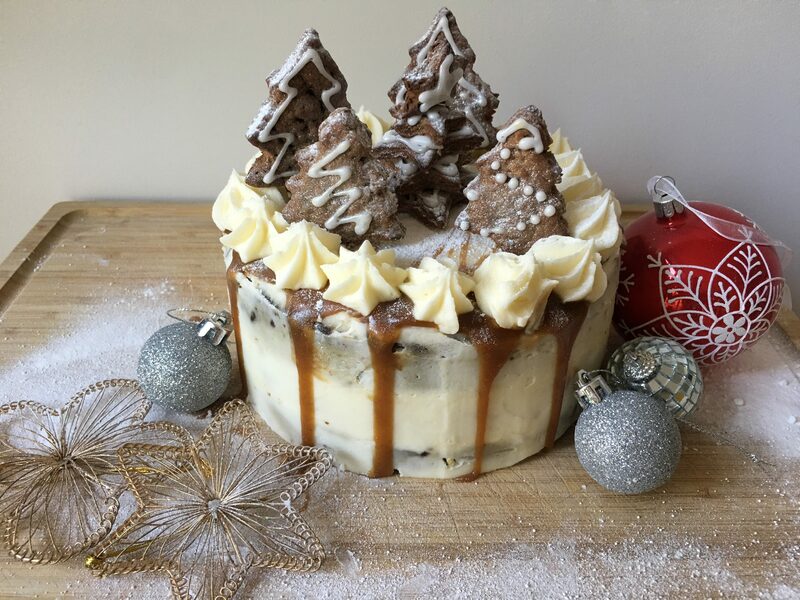 Talented local baker, Lisa, runs her own business in Welwyn Garden City, Hertfordshire called Life is Sweet Cakes, creating beautiful cakes and puddings (you can find Lisa on Facebook, Twitter and Instagram). Lisa has very kindly offered to give away a gingerbread cake just like this one worth £25, to one of our lucky Mums Off Duty readers, just in time for Christmas. This amazing cake is a three-tier gingerbread cake, with lemon frosting and gingerbread gloop from frandie macaron and ginger biscuits. How good does that sound??! The cake will be available anytime from 9th until 22nd December and the winner will need to collect from Lisa in Welwyn Garden City. This giveaway will run until midnight GMT on Friday, 24th November 2017. Please make sure you get your entry in before then. Good luck! If you’re unsuccessful in this giveaway, you can still order this fabulous cake for Christmas. Lisa is offering a 10% discount on this cake for a limited number of orders from 9th – 22nd December only*. Please contact Lisa directly to order your cake and quote ‘Mums Off Duty’ to receive your discount. When placing your order, please bear in the mind that this cake will last for about five days when stored correctly. *Lisa is only able to accept a limited number of orders for Christmas, first come first served! This giveaway will run until midnight GMT on Friday, 24th November 2017. The winner will be selected at random and notified by email within seven days of the competition closing. If the winner does not respond to claim the prize within three days of receiving our email, another winner will be chosen at random. The winner’s name will be announced on the Mums Off Duty and Life is Sweet Cakes social media channels. This gingerbread cake looks delicious! My favourite festive bake is stollen – although, after seeing this cake, I think I may now have a new favourite! Chocolate Honeycomb Mousse Cake. Not particularly a traditional Christmas bake. But I came across the recipe on a TV programme and have had several requests for repeat bakes when friend come for dinner! Lisa’s cake looks amazing! That sounds so yum! I definitely need to try that one! Thanks for entering, good luck! This cake looks amazing ! Dessert wise for Christmas I always love pavlova. Not Christmassy but my husband is a kiwi and his mum makes the best pavlova when we visit. Wow this cakes looks delicious!!! The cake looks scrummy! I love traditional Christmas pudding with brandy sauce and custard! My favourite Christmas desert is the Chocolate Fudge yule log it’s the best cake of the year! My favourite festive desert is trifle. Sherry soaked sponge, tinned fruit cocktail, strawberry jelly, birds custard and extra thick cream. Mmm a treat that takes me back to my childhood. The honeycomb cake looks absolutely delicious! Wow your ginger cake looks amazing! My favourite Christmas dessert is Chritmas pudding. It has to be Stollen, so delicious. What an amazing looking cake! My favourite Christmas bake is a chocolate Yule log, though it’s always hard to resist the first mince pies of the season! Of course! However if you win, you must share the cake with your lovely wife and kiddies! Christmas Cake and Christmas Pudding love them both. Set fire to the Pudding and put every Cherry and fruit and nut in that cake. I made some chocolate gingerbread cupcakes last Xmas, my latest festive fave, but basically I love all Christmassy cakes, traditional iced fruit ones, panettone, stollen, you name it!